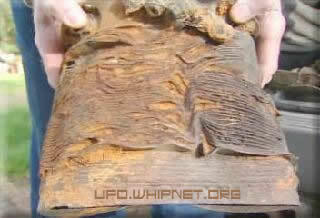 Wreckage From Secret 1947 UFO Mission Found? On the 1st of August, two Army Air Corps Officers, 1st Lt. Frank M. Brown and Capt. William L. Davidson, who had been sent to investigate the Maury Island incident, were killed when their B-25 carrying the photographs and some of the alleged UFO residue mysteriously crashed. Hundreds have searched the undisturbed corner of the Cascade foothills, about 25-miles to the east of Kelso, Washington. But for the last six decades, they found nothing. Newspapers from August 1, 1947 describe the crash of the Air Force B-25 bomber, as its left engine caught fire, and severed the plane's left wing. But as the deep forests of the Northwest had grown, they had hidden the crash site. The real story, it turns out, wasn't on the front pages of those newspapers from 1947. It was buried deeper, where reporters said the plane's crew members were "flying disk" investigators, searching for UFOs, and carrying a payload of "top secret material." One newspaper reported that "material" included pieces of flying saucers, being taken to California for examination by the Air Force. The lure of alien evidence has drawn hundreds of explorers to the area, with its steep slopes, deep canyons, overgrown ferns, and moss-covered trees. Jim Greean had been searching for the last ten years, concentrating on the higher hills surrounding the area. Jim didn't even think of the possibility the plane might have crashed into a ravine. Last Sunday, Jim was hiking along Goble Creek, following its narrow channel as it rushes towards the mighty Columbia River. It was along that Creek, a glint of sunshine caught his eye. "I looked down and there was a piece of silver looking metal. I had a shovel and I touched it and it was metal, so I slid down the bank and it was the first piece of that plane I found," Jim said. "I started going back up the Creek and it was full of metal. It was like finding gold! I finally found it!" Jim pulled dozens of pieces of debris from the mud and muck alongside the Creek. Many of the pieces were mangled, some ripped in two by the sheer force of the impact, and some charred, "This almost looks like it's black from being burned." Many more pieces of the plane, Jim left behind. "There were pieces sticking out and I just couldn't pull them out. I'm going to have to go out and dig them out." Some of the pieces of the wreckage will go on display at Seattle's Museum of Mysteries. Still, Jim didn't find any signs of alien life, or any pieces of flying saucers. He doesn't necessarily buy all the hype, "Spacecraft parts? I don't know about that." But Jim says he's anxious to discover the plane's secrets, now that he's finally found the long lost crash site.